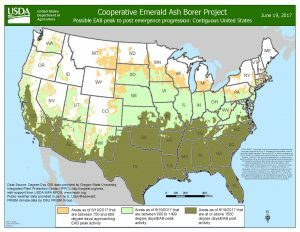 EAB peak emergence map. Tan color is approaching peak emergence, light green is peak emergence, and dark green is past peak EAB emergence. Map from June 19, 2017. Initial emergence of Emerald ash borer (Agrilus planipennis) has begun in Wisconsin and is likely occurring throughout Wisconsin at this time. Peak emergence is approaching. EAB continues to be found in new areas. 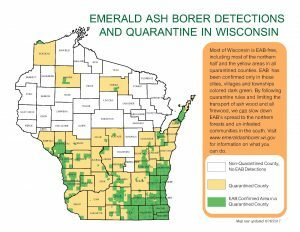 Wisconsin continues to track EAB at the municipality or township level; quarantine counties are shown in tan and infested areas are shown in green on the map below. ← The Asian longhorned beetle battle continues in some states, and a new area is deregulated.